Glastonbury - BUY THIS DVD! A documentary on the 30th anniversary of Britain's best-known music festival. 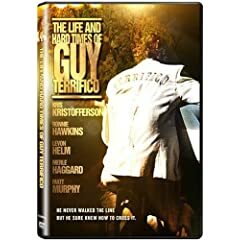 The Life and Hard Times of Guy Terrifico - BUY THIS DVD! The Last Confederate: Story of Robert Adams - BUY THIS DVD! The true love story of the conflict between Capt. Robert Adams' dedication to the south and his love for Eveline McCord, his beloved from the north. Produced, written and directed by the descendants of Robert and Eveline, this American Civil War tale is an explosive, richly detailed saga of fierce combat, honor and the will to risk all that's precious for love or country. THEN SEND IN YOUR NAME AND ADDRESS TO contests@efilmcritic.com. Put "THINKFILM AIN'T JUST WHISTLIN' DIXIE IN JUNE!" in the subject line and cross your fingers. We will draw names and one of the DVD packages from ThinkFilm will be yours. Only 1 entry per household.